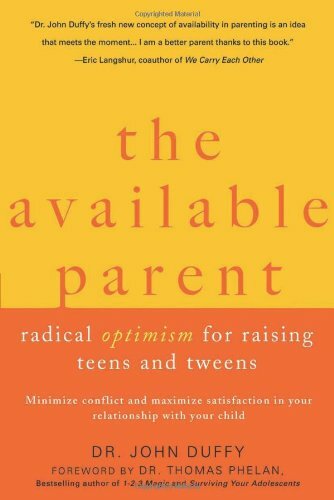 The Available Parent: Radical Optimism for Raising Teens and Tweens is a great book on parenting teens and tweens that I really love and recommend. I heard the author, Dr. John Duffy in an interview on NPR. He seemed so sensible and he gave advice that I agreed with. He mentioned the idea of "radical optimism" for raising kids. I love that phrase. I think what he mostly means by it is that we need to have faith in our influence over our children along with faith in our children's abilities. It jibes with what I was trying to explain in my post about sending my kids to a Justin Bieber concert. The teen years are not an end game, a final answer about character development or a report card on your acumen as a parent. Lecturing never works. The animosity created by the lecture itself creates a divide. View the change toward adolescence with the same sense of amazement and wonder as any other passage in life. An expectation of greatness tends to raise a teen up, not burden him. If there is a burden attached, consider whether you as a parent are operating from a place of availability or from ego. Be aware of the fine line you cross between a good-natured joke and a damaging message that becomes a lifelong part of your child's script, the ongoing self-talk dialogue in her head. Feeling the discomfort and starting the talk [about awkward or uncomfortable topics] anyway—this is the way of the available parent. Be prepared to be wrong. Competence can not be established in a vacuum. Coddling is among the worst things we can do for our kids. There's just a lot of really good advice in this book that makes sense and does seem to work. Read it and let me know what you think.